The Annual General Meeting of St. Marys, Asdee Coiste Na nOg will go ahead in the Community Centre on Saturday January 26th with a starting time of 8pm sharp. It is very important that as many parents as possible to be in attendance. Membership of the Club is now open so anybody who would like to take out membership can do so by contacting Club Registrar,Kevin Mulvihill,. Adults E20, Senior Citizens and Under Age E10. Family E50. It is important to note that Membership of the Club will close on Sunday March 31st and this will be strictly adhered to. Only fully paid up members before this date will be in line for any match tickets that the Club may aquire. Asdee G A A welcome a new member to the Club for the season ahead and who will be coming in as a Senior Selector joining John Kennedy, Dan Dalton and Sean Doran for the year ahead. Mike Enright certainly needs no introduction to G A A circles around North Kerry and beyond having played, trained and managed football and Hurling teams with great success at Senior and Junior around North Kerry with his native Ballyduff. In fact he was also involved in the Clanmaurice Ladies Intermediate Camogie side representating Kerry that went to the knockout stages of the National Finals for the past two years; Mikes recent claim to fame was as a selector on the recent Ballyduff side that won the North Kerry Junior title after a lapse of 30 years. Domiciled at Beale; without doubt the man better known as “Tricky” will see his presence and experience bring huge confidence to our Club and especially the younger players. It is a very important year for the Club not alone on the playing fields but also as the further Development of Jack Walsh Park will be going ahead. Certainly our latest Development will take top priority; as in recent years due to the inclement weather conditions we experienced; Walsh Park was unavailable to play matches for the first few months of the year which was a source of disappointment and embarrasment to the Club as a unit; having to forfeit home advantage which made winning that bit harder. So the Club have now decided to go ahead and do a major job with the surface of the field which will be commencing shortly. There are a number of Fundraisers pencilled in for the months ahead with our annual “Golden Goal” for the National Football League starting this weekend with the Kerry v Tyrone game in Fitzgerald Stadium and later the All Ireland Senior Football Championship games along with“Stars in their Eyes” both having been outstanding successful ventures. So once again we ask for your continued support. 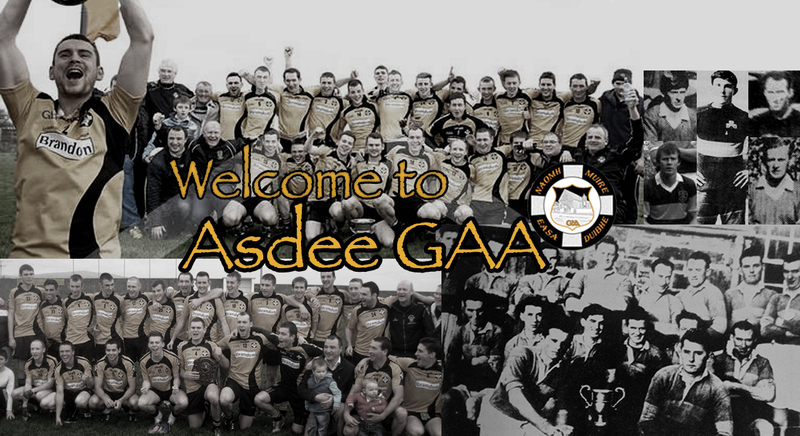 First up in early February will be the commencement of the North Kerry League where Asdee will be competing in Division 2. League format and dates to be confirmed at a Meeting of the C C C of the North Kerry Football Board. Minors will play in Division 5 of the County League which is pencilled in for Saturday February 16 with Ballyduff, St. Pats, Kilgarvan/Tuosist, Ballymac,Finuge providing the opposition. Moving on to Division 5 of the County Football League It looks like there will be 22 teams taking part as opposed to 15 last year; this is due to the fact that there will be no fewer than 7 extra “B” teams entering this Division. Looks like the Division 5 will consist of 11 teams in each group. With no disrespect to the “B” teams involved and just for argument sake why not have a Division 6 for “B” teams with promotion and relegation between Division 5 and Division 6. However this is going to be the scenario with the formation of both groups to be confirmed at last Mondays County Board meeting.